Welcome to www.sweets.lk terms and conditions page. When transacting on www.sweets.lk page you are deemed to have accepted the terms and conditions listed below. Please read the Terms and Conditions carefully before transacting on www.sweets.lk. By accessing or using this Service, you agree to be bound by the Terms and Conditions set forth below. If you do not wish to be bound by these Terms and Conditions, You may not access or use this Service. If you utilize the Service in a manner inconsistent with these Terms and Conditions, sweets.lk may terminate your access, block your future access and/or seek such additional relief as the circumstances of your misuse. Sweets.lk may modify the Terms and Conditions at any time, and such modification shall be effective immediately upon posting of the modified Terms and Conditions. You agree to review the Terms and Conditions periodically to be aware of such modifications and your continued access or use of the Service shall be deemed your conclusive acceptance of the modified Terms and Conditions. The trade marks, names, logos and service marks (collectively "trademarks") displayed on sweets.lk site are all registered and unregistered trademarks of sweets.lk. All other trademarks not owned by sweets.lk or its Partners or its Merchants that appear on this Site are the property of their respective owners, who may or may not be affiliated with, connected to, or sponsored by sweets.lk or its partners. You agree to authorize sweets.lk immediately of any unauthorized use of your account or any other breach of security. Sweets.lk will not be liable for any loss that you may incur as a result of someone else using your account either with or without your knowledge. However, you could be held liable for losses incurred by sweets.lk or another party due to someone else using your account. Sweets.lk shall not be selling products to children, but it sells them to adults, who can purchase with a credit card or stipulated payment methods. If you are under the age of 18, you may use sweets.lk services only with involvement of a parent or guardian. Sweets.lk and its partners reserve the right to refuse service, terminate accounts, remove or edit content, or cancel orders in their sole discretion. The list pricing displayed for products on sweets.lk may or may not represent the full retail price listed on the site, suggested by the manufacturer or supplier, or estimated in accordance with standard industry practice; or the estimated retail value for a comparably featured item offered elsewhere. The list price may or may not represent the prevailing price in every area on any particular day. Where an item is offered for sale by one of our Merchants, the list price may be decided by sweets.lk and the Merchants at their discretion. With respect to voucher product sold through sweets.lk site, we cannot confirm the price of the product until you have ordered; however, we do NOT charge your credit card or other payment methods until after your order has been confirmed. For Credit Card Payment ( 2checkout ) will add Transaction fee + Bank charges. There shall not be any refunds/returns affected via sweets.lk. However cancellations (for eg. due to an error in software application) may be effected based on proof of issue. Sweets.lk has the right to cancel an order under any circumstance due to typographical or unforeseen errors that results in the product(s) on the site being listed inaccurately (having the wrong price or descriptions etc.). In the event a cancellation occurs and payment for the order has been received, Sweets.lk shall issue a full refund for the product / service in the amount in question. Additionally, you can cancel your order during the processing phase. Once your order is complete and your products are delivered and paid for, you can no longer cancel the order. Sweets.lk and all information, content, materials, products (including software) and services included on or otherwise made available to you through the site are provided by sweets.lk or its Partners on an "as is" and "as available" basis, unless otherwise specified in writing. 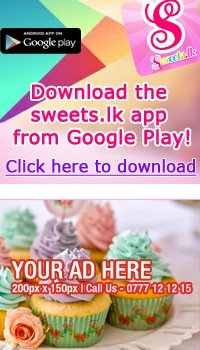 Sweets.lk and its Partners make no representations or warranties of any kind, express or implied, as to the operation the sweets.lk site or the information, content, materials, products (including software) or services included on or otherwise made available to you through sweets.lk site, unless otherwise specified in writing. You expressly agree that your use of the site is at your sole risk. To the fullest extent permissible by applicable law, sweets.lk and its Partners disclaim all warranties, express or implied, including, but not limited to, implied warranties of merchantability and fitness for a particular purpose. Sweets.lk and its Partners do not warrant that this Site; information, content, materials, products (including software) or services included on or otherwise made available to you through sweets.lk; their servers;, or other harmful components. Sweets.lk and its Partners will not be liable for any damages of any kind arising from the use of the sweets.lk or from any information, content, materials, products (including software) or services included on or otherwise made available to you through the sweets.lk, including, but not limited to direct, indirect, incidental, punitive, and consequential damages, unless otherwise specified in writing. Sweets.lk reserves the right to recover the cost of goods, collection charges and lawyers fees from persons using the Site fraudulently. Sweets.lk reserves the right to initiate legal proceedings against such persons for fraudulent use of this service and any other unlawful acts or omissions in breach of these terms and conditions. 1. That in the event of a non-delivery occurs on account of a mistake by you (i.e. mobile number or any other wrong information) any extra cost incurred by sweets.lk for redelivery shall be claimed from you. 2. That you will use the services provided by sweets.lk , its affiliates, consultants and contracted companies, for lawful purposes only and comply with all applicable laws and regulations while using the service /transacting on the application. 3. You will provide authentic and true information in all instances where such information is requested of you. Sweets.lk reserves the right to confirm and validate the information and other details provided by you at any point of time. If upon confirmation your details are found not to be true (wholly or partly), sweets.lk has the right in its sole discretion to reject the registration and debar you from using the Services without prior intimation whatsoever. 7. To carefully read the description of the product and the retail brand’s location before placing the order. You are prohibited from violating or attempting to violate the security of sweets.lk, including, without limitation, (a) accessing data not intended for you or logging onto a server or an account which you are not authorized to access; (b) attempting to probe, scan or test the vulnerability of a system or network or to breach security or authentication measures without proper authorization; (c) attempting to interfere with service to any other user, host or network, including, without limitation, via means of submitting a virus to the application, overloading, "flooding," "spamming," "mailbombing" or "crashing;" (d) sending unsolicited email, including promotions and/or advertising of products or services; or (e) . Violations of system or network security may result in civil or criminal liability. Sweets.lk will investigate occurrences that may involve such violations and may involve, and cooperate with, law enforcement authorities in prosecuting users who are involved in such violations. You agree not to use any device, software or routine to interfere or attempt to interfere with the proper working of the application or any activity being conducted on this application. We do not sell or rent your personal information to third parties for their marketing purposes without your explicit consent. We view protection of your privacy as a very important community principle. We understand clearly that you and Your Information is one of our most important assets. We store and process Your Information on servers located in Sri Lanka, that are protected by physical as well as technological security devices. We use third parties to verify and certify our privacy principles. If you object to your Information being transferred or used in this way please do not use this service. Sweets.lk reserves the right, in its sole discretion, to modify the Services from time to time and without notice, including by removing, adding, or modifying Products and/or third-party Merchants. Sweets.lk shall have no liability to you for any modification or discontinuation of the Services. If you object to any such changes, your sole recourse shall be to cease using the Services. Continued use of the Services following any such changes shall indicate your acknowledgment of such changes and satisfaction with the Services as so modified. You can contact us at the following address for any further queries or any difficulty you may have with the Site.